A septic tank system serves as an onsite system to treat and dispose of domestic wastewater. 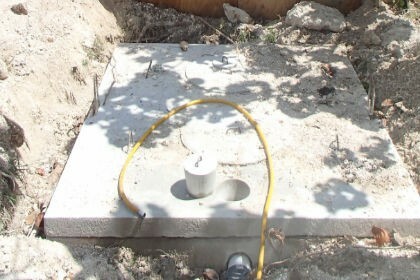 In the Cayman Islands, a septic system is made up of a structurally sound, two compartment watertight tank discharging to an effluent disposal well (a drilled borehole with a grouted casing below which the liquid waste drains). A grease interceptor is required at all commercial and institutional food service facilities. A grease interceptor is a modified septic tank designed to intercept, i.e. hold back, grease and solids contained in wastewater from kitchen fixtures and equipment including pot sinks, pre-rinse sinks, dishwashers, soup kettles or similar devices, and floor drains. The outlet of the grease interceptor shall be plumbed to the sanitary sewage line leading to the onsite wastewater treatment system.